Matthew Joseph Cable is a fictional character appearing in DC Comics' Swamp Thing series. Introduced in Swamp Thing (Volume 1) #1 in November 1972, he died and was later resurrected as Dream's raven in Neil Gaiman's rendition of The Sandman. Matthew Cable was a government agent assigned to protect Alec and Linda Holland while they worked on their bio-restorative formula deep in the Louisiana swamps. Unfortunately Cable was unable to save them from the machinations of the Conclave, a sinister organization that wanted the couple to work for their own nefarious ends, and the Hollands were killed. When Swamp Thing rose from the bayou, Cable believed it responsible for the Hollands' deaths and set out in pursuit, intent on avenging his friends' murders. Cable's search took him through the Balkans where he met Abigail Arcane, a longtime friend to Swamp Thing and niece to Anton Arcane, a ruthless man who wanted Swamp Thing's secrets so he could become immortal. For years, Swamp Thing believed himself to be Holland, and eventually revealed to Cable that he was "Alec", which led Cable to let him go. Cable and Abby would later get married and settled in Houma near Swamp Thing. 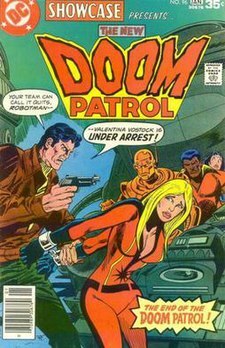 He encountered the Doom Patrol during this time (in the 1977 Showcase series) as well. Eventually, Cable's mind was damaged, resulting in him gaining the ability to alter reality itself. His marriage with Abby quickly deteriorated as a result, causing Matthew's abuse of his power in the form of obscene sexual acts, such as using his powers to create decaying forms to arouse and please him, all the while straining his marriage even further. Matthew only seemed to be able to access his power while stressed or intoxicated. After a fight with Abigail that culminates in her leaving on foot to find the Swamp Thing, Matthew has an attack of conscience and drives after her. Having been drinking heavily, he ends up crashing his car, mortally wounding himself. A huge unnatural fly landing by him said it would revive him, and he agrees allowing it to crawl down his throat. In reality, Anton, who had since died and gone to Hell, finds a way out by way of Cable. He possesses the fly and then Cable's body and with it gains Cable's godlike power. Eventually Matthew manages to send Arcane back to Hell, but at the cost of the effects of the car-crash catching up with him, and only after Arcane had molested and killed Abby. (The plot point, incidentally, that resulted in DC dropping the Comics Code seal on Swamp Thing for good, adding instead the words "Sophisticated Suspense" across the top) Still possessing enough power to repair one body and not wanting to live, he manages to bring Abby back to life (though her soul would still have to be rescued from Hell by the Swamp Thing, who succeeds in doing so). Apologizing to "Alec", he then falls into a coma. After lessons learned within The Dreaming while comatose, in order to help Abigail move on, an emaciated Matt rises one final time and destroys the machinery sustaining him, ending his life. Since Matthew technically died while in the Dreaming, Morpheus/Dream of the Endless revived him to a form of life as his raven. This is more true than Matthew first suspected ("I suppose I figured I'd be a man in a raven's body. Nope, it don't work like that. I'm a raven.") He lives with Eve in Dream's domain. His purpose—and the purpose of any of the Ravens that Morpheus has had previously—is somewhat questionable. Morpheus seems to keep the Ravens around out of some sort of unspoken need for companionship. The Ravens are created by Morpheus, offering the position to people who died, usually while dreaming, and releasing them from service if they so wished. Matthew is irreverent and somewhat crude, having a questionable life behind him. However, he served Dream loyally by providing advice and occasionally going on missions for him. His loyalty extended so far that when Morpheus was slain, he at first was going to seek release from service to Daniel, who had taken Morpheus's place as Dream. He eventually decided to stay on as Daniel's Raven. In The Dreaming series Matthew plays a more important role and was often teamed with the Corinthian. He died twice more during the series, once as a result of being tricked by the Coyote, and for a final time by an accidental shot from Lucien during a fight with Echo and Eblis O'Shaughnessy. He came back briefly to tell Daniel not to let Lucien blame himself. The lettering of all ravens' speech is messy at the edges, and so are the speech bubbles, perhaps indicating a gravelly voice. Notable predecessors as the Raven are Lucien, who was the first Raven, and Aristeas of Marmora who, centuries later, returned to his life as a man for a year. Disturbingly, when Delirium tried to recall the other of Dream's ravens she had seen, she mentioned 'Eleven and a Half'. Other predecessors who are mentioned are Jessamy, Francois, Jehuda, Vivien, Ming-Ti, Dechtire, and Hatshepsut. After Matthew's death Daniel enlisted Tethys, a deep-sea creature who had dreamed of the surface world, to serve him as a white raven. Henderson Wade will be portraying Cable in the upcoming DC Universe series Swamp Thing where he will be a Louisiana lawman alongside his mother, Sheriff Lucilia Cable portrayed by Jennifer Beals. In the Swamp Thing film, the character of Alice Cable (played by Adrienne Barbeau, who later voiced Catwoman in the DC Animated Universe) is loosely based on Abby Holland - basically an amalgam of her and Matthew Cable. She is portrayed as a government agent who falls in love with Alec Holland, aka Swamp Thing. Roots of the Swamp Thing - An extremely detailed timeline chronicling all the events of Swamp Thing, Hellblazer and related titles in chronological order, covering the life of Matthew Cable. ^ Andreeva, Nellie; Petski, Denise (September 28, 2018). "'Swamp Thing': Jennifer Beals Joins DC Universe Series In Recurring Role". Deadline. Retrieved September 28, 2018. ^ Boucher, Goeff (November 7, 2018). "'Riverdale' Actor Henderson Wade Joins 'Swamp Thing' Cast As Matt Cable". Deadline. Retrieved November 7, 2018. This page was last edited on 10 March 2019, at 03:10 (UTC).